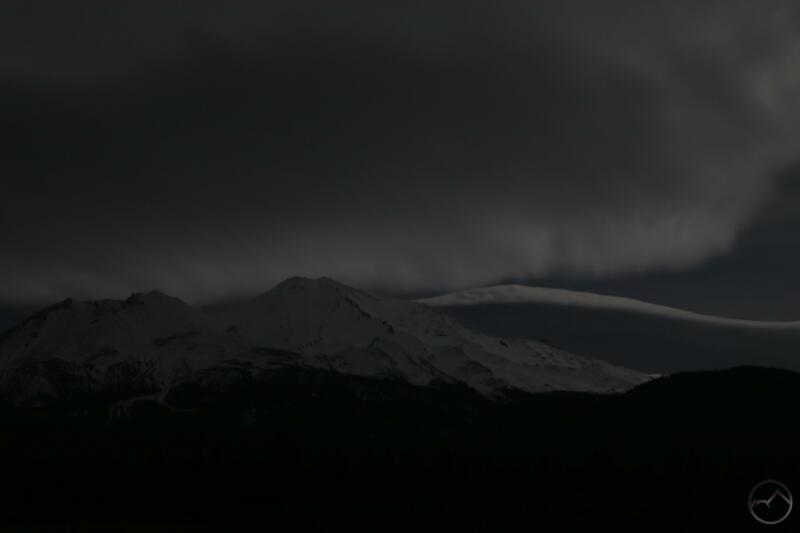 Mount Shasta on New Years Eve 2012. 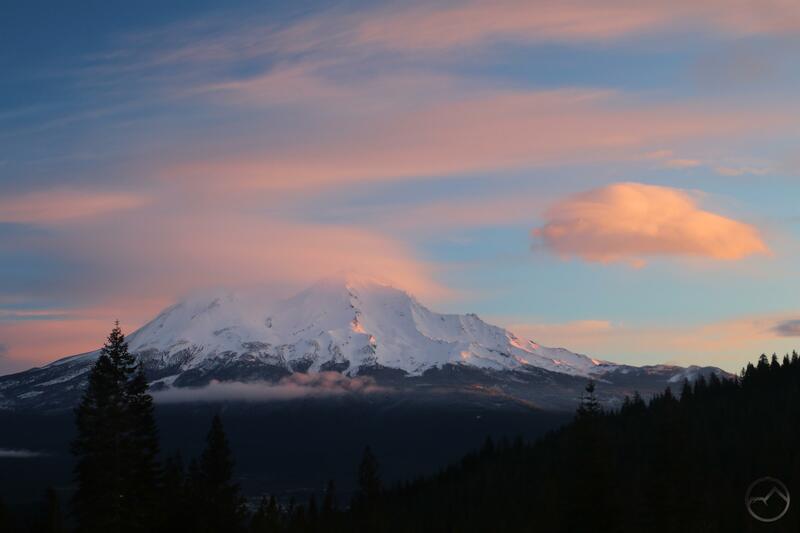 One month later, the first image posted on HikeMtShasta. 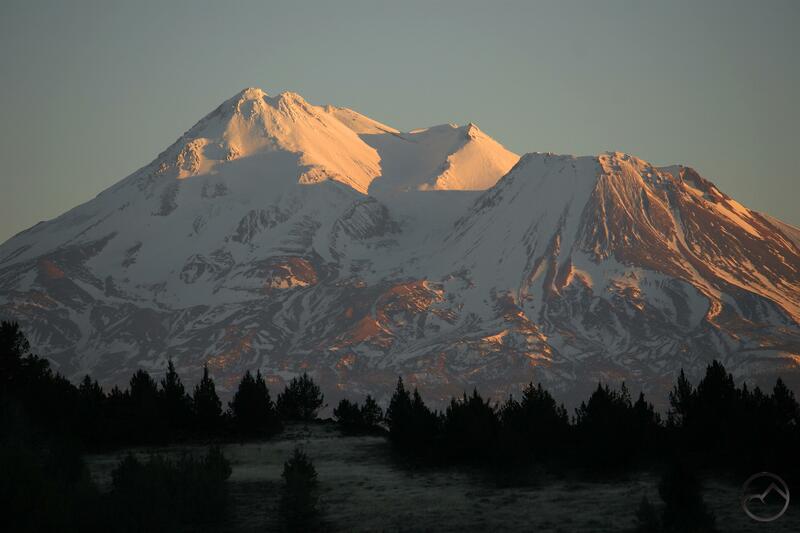 Today marks five-year anniversary of the founding of Hike Mt Shasta. It is hard to believe that this website has been a part of my life for half a decade. It has led countless adventures, great exploration, a few surprising friendships and more fun than I could shake a stick at. Hopefully it has led to many of these same things for all of you who have been reading it and following along all these years. 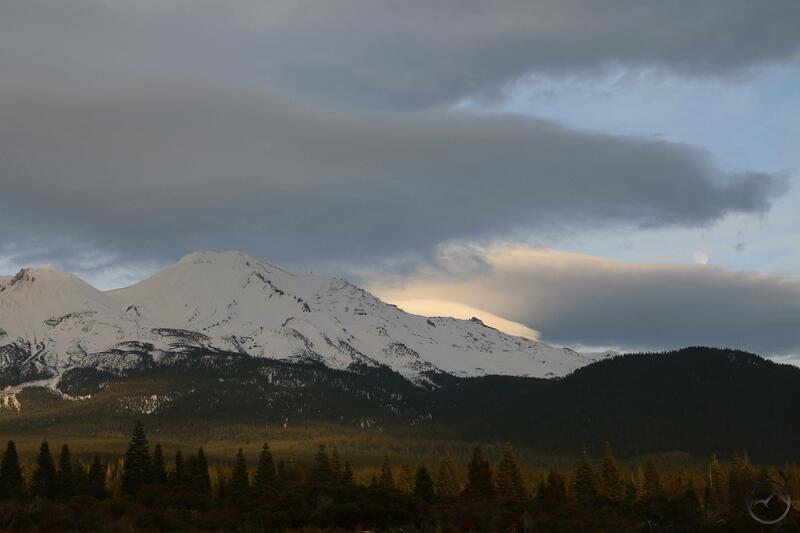 The whole purpose of this site has been to celebrate Mount Shasta, the surrounding area and the natural world in general. I sincerely desire the site to add to people’s love of and experiences in Creation. 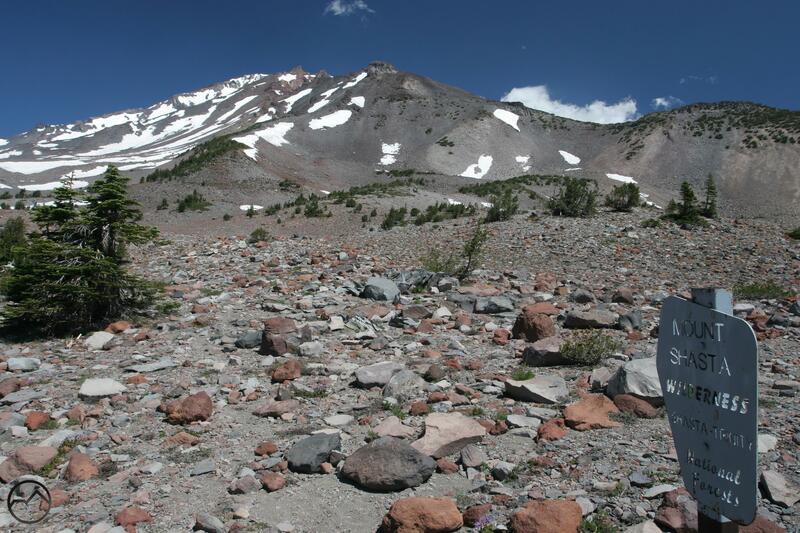 Though five years is a significant landmark, I don’t really feel the need to write a significant post about the history of this site, considering I did something of that nature last June, when Hike Mt Shasta received its 1,000,000th hit. If you are interested in a bit of a retrospective, click here for that post. I am obviously a bit partial, but I do think it is a bit of an interesting read. 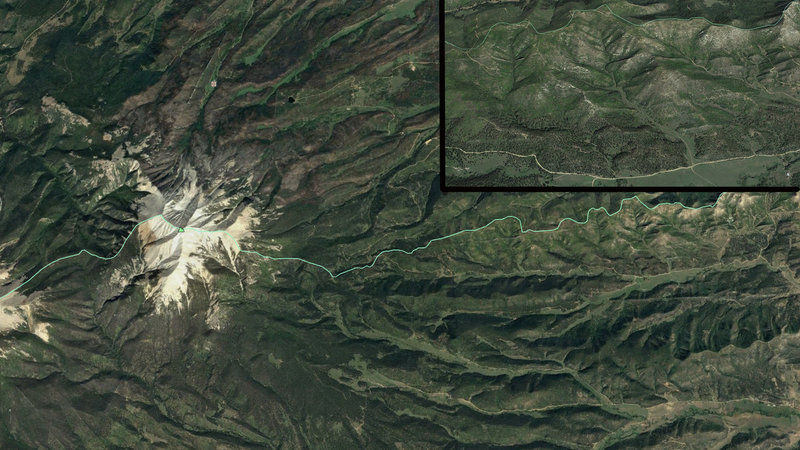 As with all things, Hike Mt Shasta has changed subtly over time. The first couple years saw a flurry of new trails posted on the site. Now that it is a fairly comprehensive resource, there has been less of that and the blog itself has absorbed more of my attention. While I do still have a few trail pages in the works, I am beginning to deemphasize that side of Hike Mt Shasta. Some may have noticed that I have removed the trails from the margin on the right side of the page. All those descriptions exist, but are now found in the drop down menu. Most of the blog posts I have written are also found in the “articles” drop down menu. In time, those descriptions may quietly disappear too. The site has far exceeded my expectations and, at times, I am concerned with what kind of impact making too many people aware of certain areas can have. I am not yet convinced that I need to remove that resource, but it is a tension that I do feel. Other places have been negatively impacted by too much information on the Internet and that is not my desire for the Mount Shasta Area (yes, I am aware of the irony. As I said, this is a tension that I struggle with). The subject of wilderness in the age of social media brings me to another topic of change here. I intend for this to happen gradually, but I have been itching to write more on other parts of the Western United States as well as broader topics related to the outdoors, wilderness and the philosophy, theology and ethics of the natural world. While I still plan on writing about Mount Shasta and its environs, I going to branch out. I hope everyone will find benefit to these thoughts. This will be a gradual change. Also, I love hearing feedback on what works and what does not. Please let me know your thoughts on any of these matters or any of my articles! Lastly, I hope everyone would consider supporting this site by purchasing my hiking guides. I have intentionally not monetized this website and the only adds that appear are those that support WordPress, rather than my own endeavors. Nonetheless, any support offered is greatly appreciated and will, in one form or another, end up back on the site for everyone’s edification. You can find the Amazon pages for the books by following these links: Hiking Northern California, Hiking Mount Shasta, Hiking California’s Wine Country. So, thank you again to everyone who has been following along at any point over the last 5 years. It has been a blast to bring the beauty of Mount Shasta and all of Northern California to all who have been hungry to explore it, whether on the trail, for from afar, through word and image. I hope you will continue with me for another 5 years! I love this town and this mountain! I hope everyone enjoys it as much as I do! The Cinder Cone is a remarkable landmark at the southern end of the Cascade Range. It was cold and snowy today and while my kids were out building snow castles for their dragons, I thought I might write about one of the vintage maps I have in my collection. 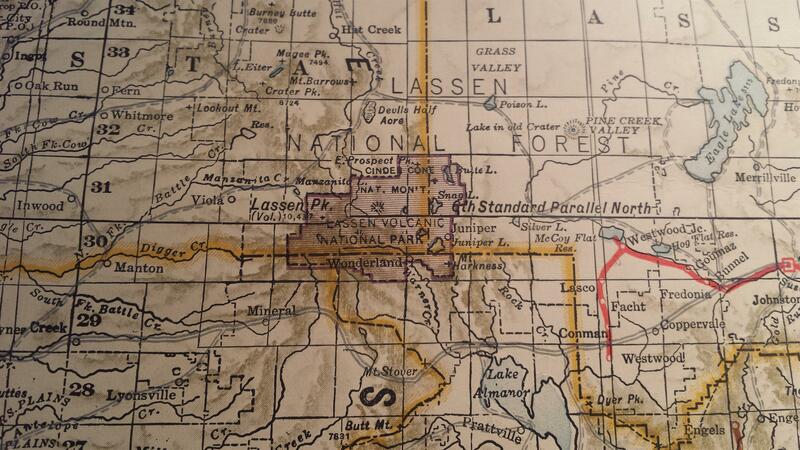 Last year I came into possession of a number of great digital maps from the 19th and early 20th centuries. Most of these covered the Mount Shasta area and revealed all sorts of interesting historical, topographical and geographic facts. I tucked those maps away, planning to write about them over the winter. However, today I am not going to write about one of those. Instead, I want to focus on one of the maps I saw at a friends house earlier this week. He has a phenomenal collection of maps, though his are the real thing, hanging on walls or filed in his extensive set. The one in particular that caught my eye was one of California from 1926 that should all the railroad right-of-ways that existed at that time. 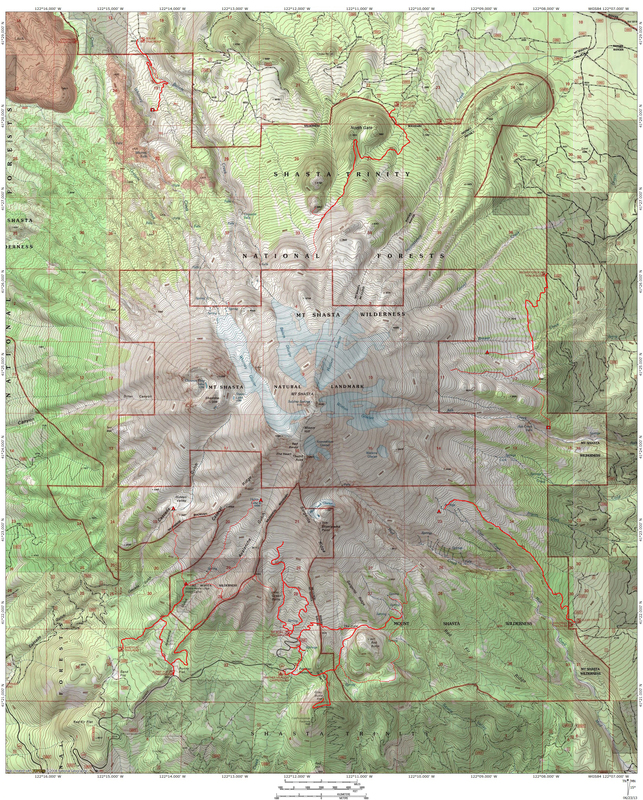 While the entire map was fascinating, what specifically caught my eye was the boundary of Lassen Volcanic National Park and the presence, in the northeast corner of the park, of a separate entity labeled as Cinder Cone National Monument. This national monument has always been a subject I found quite interesting, not only because it encompasses my personal favorite part of the modern Lassen Volcanic National Park, but also because the area, which was initially held in esteem high enough to be preserved on its own merits, separate from but contemporary with Lassen Peak itself. 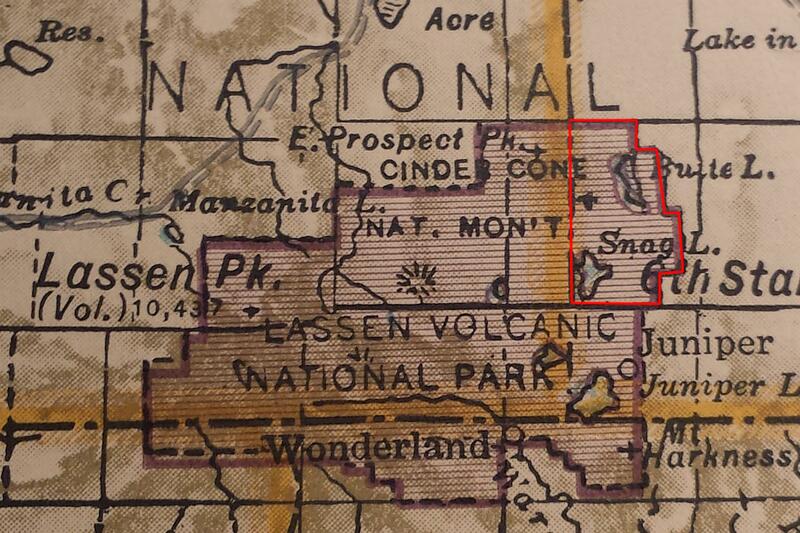 Approximate boundary of Cinder Cone National Monument marked in red. President Theodore Roosevelt established Cinder Cone National Monument and Lassen Peak National Monument in 1907. The great conservationist president recognized the importance of the beautiful and unique volcanic features of the Lassen area. Their preservation was one of the many important conservation acts of his momentous presidency. Together, the two monuments totaled about 6,400 acres. 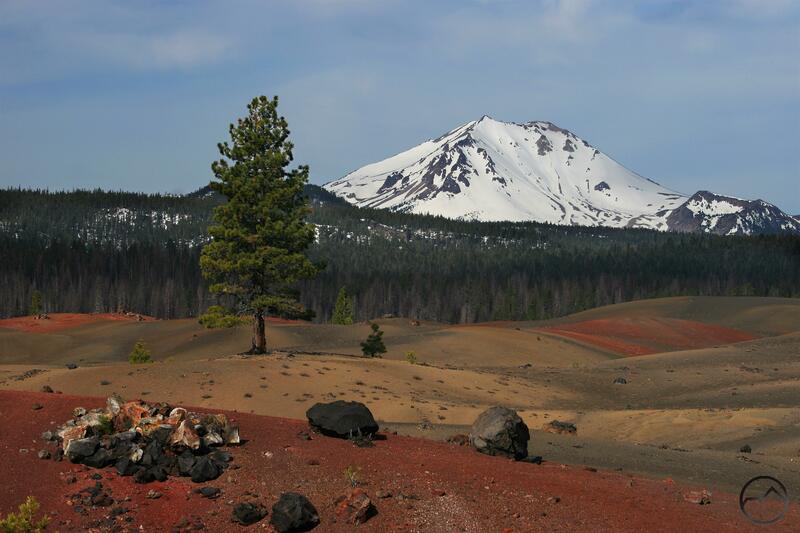 Most of this area was contained in Cinder Cone National Monument, which included Butte and Snag Lakes, the Fantastic Lava Beds, the Painted Dunes and the Cinder Cone itself. The rest of the area was contained in Lassen Peak National Monument, which consisted of little more than the peak itself. Lassen Peak viewed from the Painted Dunes. This was the case until 1914, when Lassen Peak began a series of eruptions. A year later the volcano let loose a major eruptive event that was visible throughout much of the North State. Lassen Peak continued in an active state until 1921, when the eruptions finally ceased. However, in 1916, a year after the major eruption, congress created Lassen Volcanic National Park. It took the two existing national monuments and combined them into the single park that we enjoy today. What was once Cinder Cone National Monument became the northeast corner of the new park. Despite being of such significant beauty and geologic interest that it warranted the establishment of a national monument, the Cinder Cone area is a lonely backwater of Lassen Volcanic National Park. The western half that focuses on the high country and geothermal features around Lassen Peak is easily the busiest part of the park while the southern section, with good access from Chester and the Lake Almanor area sees a steady flow of visitors. In contrast, the Cinder Cone area is near no population centers and requires many miles of driving along a dirt road (which is well maintained and easily passable in a normal car). Even though it is the loneliest part of the Lassen Volcanic National Park, it is easily one of the most beautiful. The area does not lack for activities either. There are many miles of trail to fascinating geologic features and passing through remote and beautiful backcountry. There are lakes to explore, peaks to climb, vistas to enjoy and large campground from which to base all these adventures. 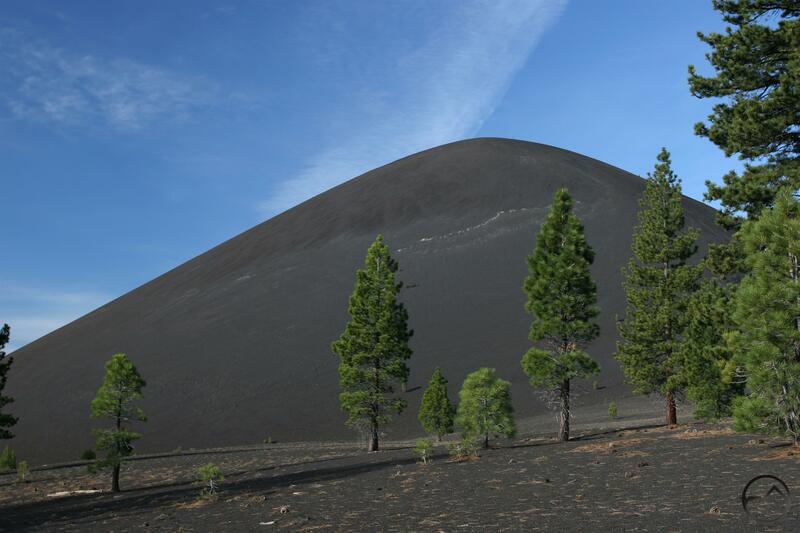 Though Cinder Cone National Monument may have been absorbed into the larger park, the area it was intended to protect still commands attention and admiration to this day. Well, Winter Finally Started To Show Up! 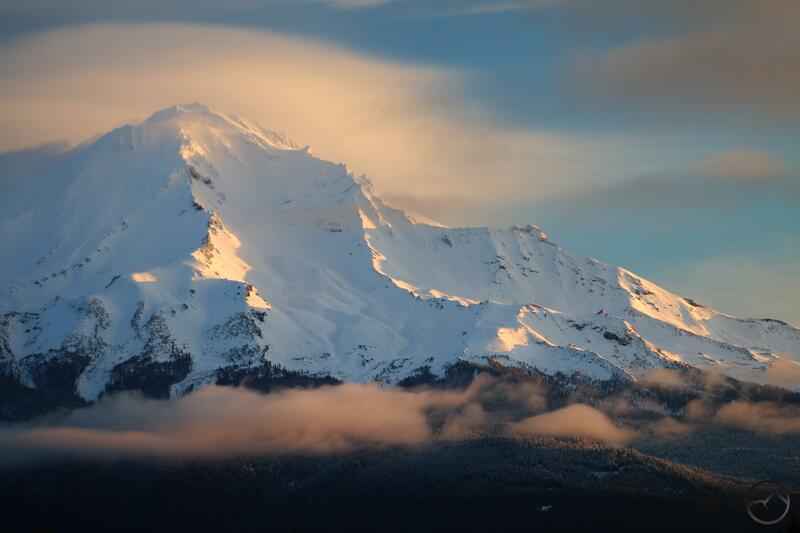 Mount Shasta, fresh from a January winter storm. Our first real taste of winter snow finally arrived. Depending on where you gauge, the storm dropped anywhere from 2-4 inches in the populated areas. At my house, we got closer to four inches. This is an important benchmark for a couple or reasons. Not only does it, after much delay, mark the onset of winter in all of its necessary forms but it also sets a snow measurement standard. More specifically, the really bad drought winters of 2013/2014 and 2014/2015 yielded little more than what this storm has given us. Consequently, if any more snow falls this winter, it will be an improvement over those wretched years. My backyard Sunday afternoon and on Monday morning, after a snowy night. Of course, here at the Hike Mt Shasta household, the kids kicked the snow play into high gear and got out early this morning. This year was the first time they were old enough to get out and shovel the walkways off themselves. Thank goodness for that! I also had a chance to get my new drone out and test it out for the first time in winter conditions. The camera is not a super high quality and I am still getting the hang of the thing, but I hope to add some interesting drone footage to Hike Mt Shasta once I get it out on the trail. My backyard on a snowy morning, from several hundred feet up. The storm was not a major snow event, but it broke the ice as far as waiting for the white stuff goes, no pun intended. With February and March yet to go, we still have the potential for some really significant weather. Of course, access to the higher trails on both Mount Shasta and in the Trinity Divide is definitely much harder now and those of us looking to get out and hike are limited to the lower trails. Read about those in my 2018 Winter Hiking Round Up. Fortunately, we are blessed with numerous great options and have much to enjoy, even during winter! 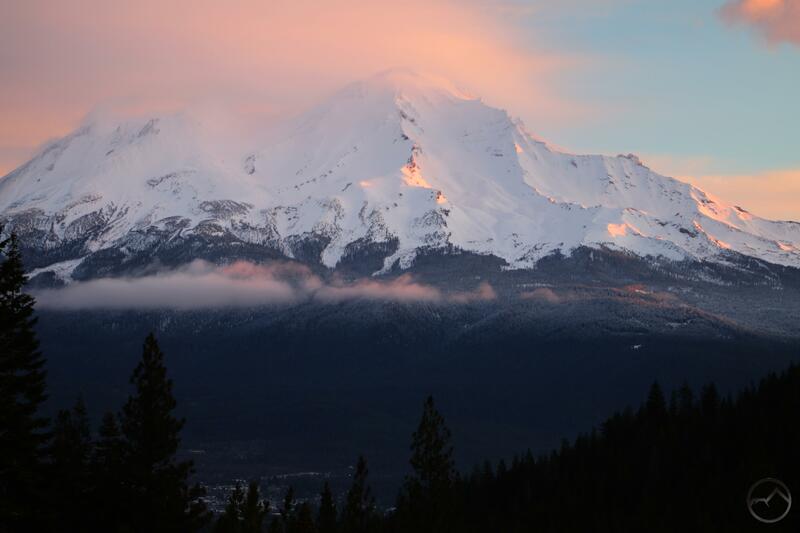 Winter sunrise on Mount Shasta. Though the cold has been with us for several months now, the rest of winter has been late in arriving. However, with this last bout of precipitation and the hint of more on the horizon, I figure that now is finally the time where it is safe to say that most of the high trails are closed off and those of us who wish to hit the trails are relegated to the paths that course through the lowlands. 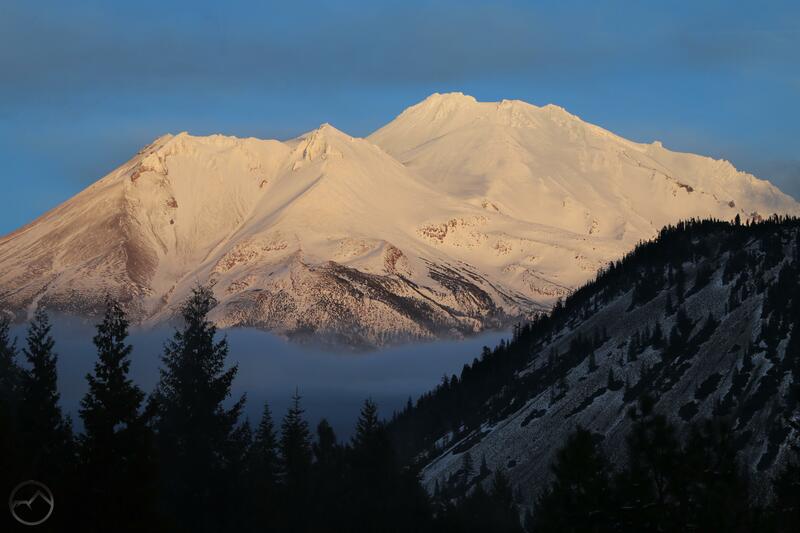 Fortunately, the Mount Shasta area is well-situated to offer hikers plenty of opportunities to get outside and still enjoy some remarkable beauty, even in the winter. These opportunities are not few either. Whether you want to explore roaring rivers, lakeside paths with great views, rugged canyons, alpine vistas, deep forests, high desert terrain or unique geological features, the lands that lie at the foot of Mount Shasta offer all of these things, even in the dead of winter. This excellent opportunity is, in large measure, a reflection of Mount Shasta’s geology. The mountain rises out of low valley that lies between the high mountain areas of the Cascade Range and Klamath Mountains. The valley floor itself is low enough that it often escapes the snow that falls at higher elevations. The rivers then rush south, falling lower in elevation still and avoid even more snow. Yet, too the north lies the rain shadow of Mount Shasta. Rather than great conifer forests, the area is desert, thanks to the mountain wringing moistures from the storms that move through. Here, the snow falls infrequently and the trails that explore this area offer hikers great views, lots of sunshine and a strikingly different kind of environment from the alpine areas immediately to the south. Whatever you are looking for in a winter trail, it is hard to find a more diverse and spectacular setting than those around Mount Shasta! 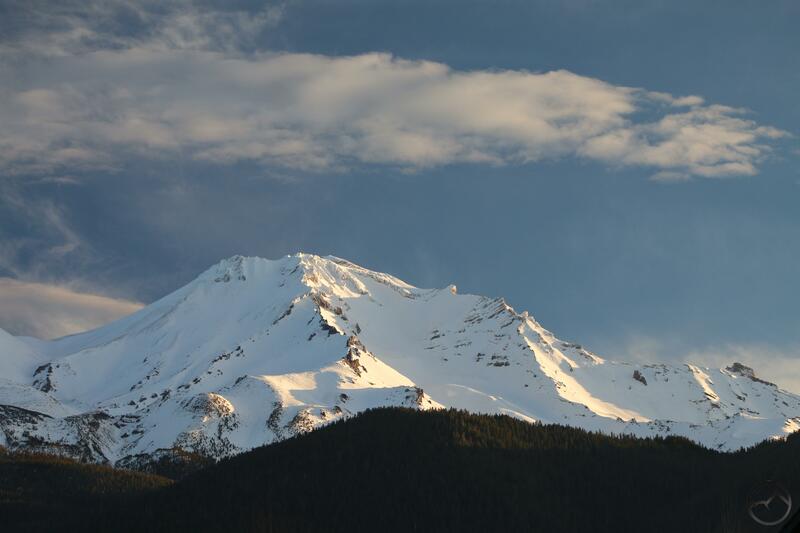 The following are all articles that discuss off-season hiking opportunities in Mount Shasta. They can also be accessed from the “trails” drop down menu. Click to enlarge all images. Mount Shasta City is blessed with a number of great paths within and just outside of its city limits. Three of the best are the Box Canyon, Ney Springs and Spring Hill Trail. These offer solitude, Mount Shasta Vistas, unique history, spectacular geography and even some excellent waterfalls. These all lie just minutes outside of town. Also, don’t forget that Mount Shasta City has some great short trails right in town! Read more here. Box Canyon of the Sacramento River. Rocky Point on the Spring Hill Trail. 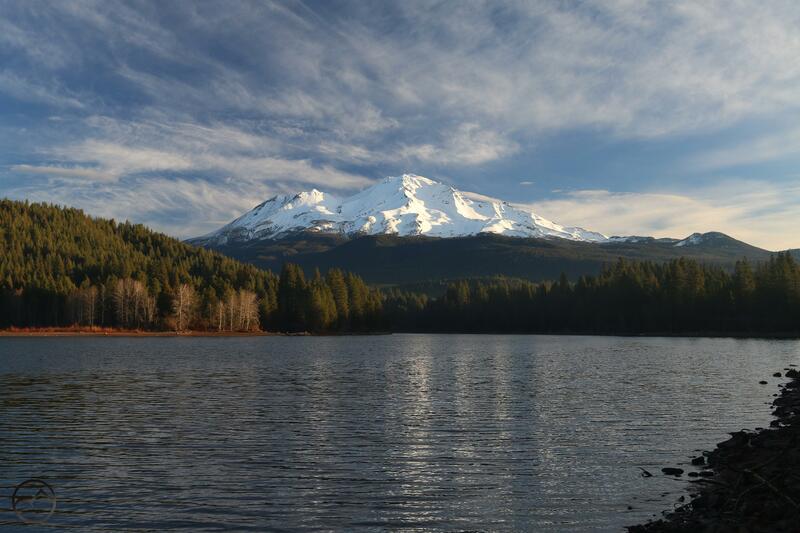 The Lake Siskiyou Trail is an incredible recreational resource just a couple minutes outside of Mount Shasta City. During the summer and fall, a loop trail encircles the lake. However, in winter the seasonal bridges over the Sacramento River are removed. While the loop can’t be hiked without fording the river (extremely dangerous after storms and during high runoff), several sections of the trail still make great out and back hikes. They feature beautiful forests, the lake itself and incredible views. Read more here. Mount Eddy at the Sacramento River inlet. Most people in California think of the Sacramento River as the wide, winding waterway that lazily flows through the Central Valley. Here just below the headwaters, however, it is a swiftly flowing mountain river. Deep in its canyon, the lower elevation means it is often free of snow and the trails are easily accessed. Hiking along the river in winter is a treat that offers a taste of wild mountains for minimal effort. Read more here. Rapids Along the River Trail. Along the Sacramento River Trail. North of Mount Shasta, the desert landscapes of the Shasta Valley offer a strikingly different environment than what is found along most trails in the region. The only conifers here are junipers and sagebrush is ubiquitous. For those that like the desert, the beauty of this area needs no explanation. For those less familiar, there is ample wildlife, beautiful rock formations and magnificent 360 degree views, crowned by some of the best views of Mount Shasta to be found anywhere. Read more here. At the northern end of the Shasta Valley lies a large parkland administered by the State of California. The Shasta Valley Wildlife Refuge was once a working ranch but is now a haven for a variety of wildlife, especially birds. It is also a refuge for hikers looking for incredible vistas. Though it can be closed at times during winter, there are still opportunities to explore it and once it is reopened completely, it is a place of great beauty, beckoning to be explored! Read more here. 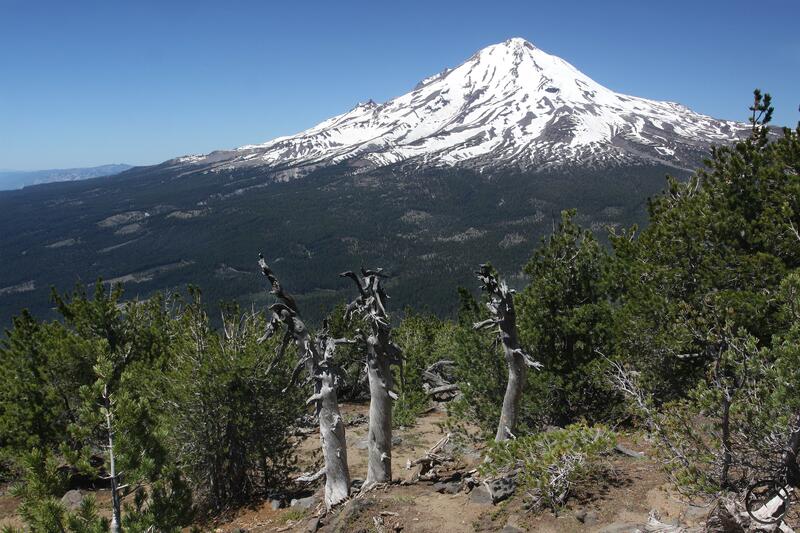 Other parts of the Mount Shasta area are best hiked in spring, but often, during drier winters with less snow, some of these areas are also easily accessed during winter and offer stunning hikes for those looking for longer and more rugged outings. It must be noted that these areas have a higher chance of being inaccessible during snowy winters. The Castle Crags are one of the most majestic mountain features in California. However, their lower elevation means they are often accessible when higher terrain is still smothered in snow. Still, the granite spires and great rock walls stand shoulder to shoulder with some of the most rugged terrain in the state. Though best hiked in spring, when the creeks are gushing and the weather, especially on the south side where most trails are found, is perfect, the winter may still be a good time to get out and enjoy this gorgeous mountain playground. Read more here. The McCloud River is one of the great attractions of the Mount Shasta area. With great fishing, a trio a awesome waterfalls, and beautiful forest surroundings, it is a popular destination. The waterfall along the river is a great hike and ought to be considered during winter if the access road is open. However, the McCloud River Trail follows the river for 15 miles and any section of this makes a great hike as long as snow is not covering the ground. Read more here. The McCloud River downstream from Cattle Camp. The Lower McCloud River sees far less activity than the upper section. Separted by Hearst property and the McCloud Reservoir, the two areas are strikingly different. The upper section flows through volcanic terrain while the lower part passes through an outlier of the Klamath Mountain. The terrain is very rugged and can be difficult access during winter. However, when it can be reached, solitude a beautiful scenery await! Read more here. The McCloud River from the PCT crossing. Mount Shasta, midway through January 2018. Little snow below tree line. As we reach the middle of January, we are still waiting for the snow to come. It takes patience, perseverance and faith to abide, waiting on things over which we have no control. Fortunately, it looks like a storm may be brewing in the week to come. Perhaps we might yet get a good snow storm in January. We still have February and March to sweep storms through our area. Still, it is hard to believe that, one year ago, we were in the grip of a snow storm the likes of which had not been seen in these parts for a good 5 or 6 years. The weather came in and pounded the entire northern two thirds of the California. 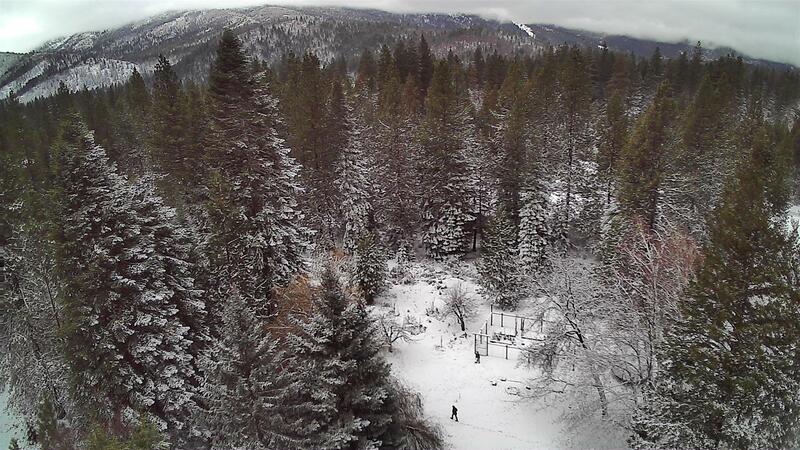 The Cascades and the Sierra Nevada were inundated with record levels of snow. This was a blessing much looked for, since California was in the grip of the worst drought in nearly 40 years. Even today, with a dry winter thus far, the reservoirs and even the snowpack are in far better shape now than they were the last several years because of the copious amounts of rain and snow that fell last winter. Let us hope that this winter still proves to be a solid follow up to the last. 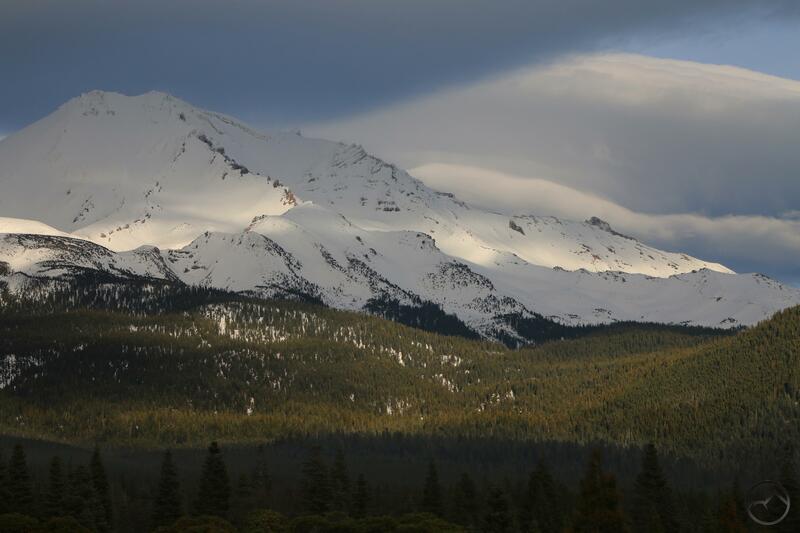 Looking back at the posts I put up of the storm, I realized that, due to the drought, that was the biggest, indeed, the only, major storm to hit Mount Shasta since I started this website. I always look back to the winters of 2010 and 2011 as the heaviest since I moved here and the site was started in 2013. Every winter in that period was below average or suffered extreme drought. Being able to photograph things and write about all the snow was a refreshing opportunity. Now, as we wait for the winter to functionally commence, I reckon it may be worth looking back and remembering the storm from a year ago. I hope we have another soon. First wave of storm. The first real snowstorm we had in a long time. Follow up to first wave. Break in the storm and assessing the state as a whole. Not many folks read this one, but I thought it was interesting. Second wave of the storm. This was when the snow really piled up! Aftermath of the second wave. Simply one of the most beautiful days in Mount Shasta in a long time! It was an epic week. I pray we have another soon! Mount Shasta from the north. 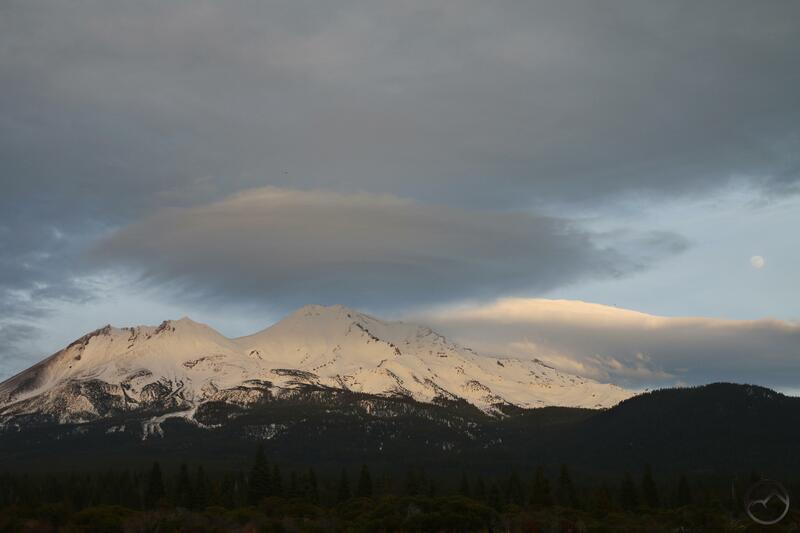 Evening light reveals the layered depth of Mount Shasta 4 eruptive cones. The geology of Northern California is a subject of endless fascination, with its many mountain ranges, varied geologic compositions and complex associations that these create. 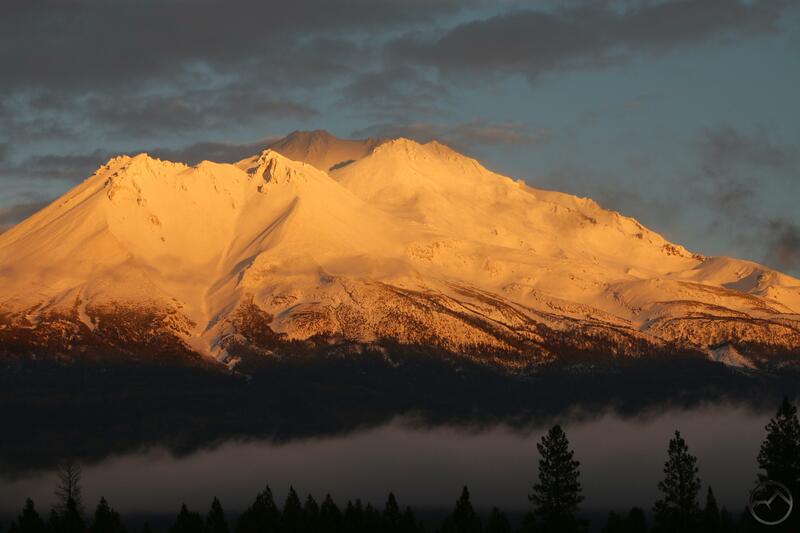 Mount Shasta is a microcosm of many of the features, condensed down into a single mountain. While there are indeed different types of rock within the mountain, it remains relatively homogeneous in the sense that all the types are of volcanic origin. However, the volcanic genesis of Mount Shasta is, in fact far more varied than many casual observers might suspect. Yet even the quickest of surveys of the mountain cannot help but notice the mighty satellite cone of Shastina protruding abruptly from Mount Shasta’s northwest flank. This is ready evidence that there have been more than one eruptive period for California’s great volcano. Indeed, this unmissable landmark is the gateway observation to a far more complex geologic history. Three eruptive cones viewed from the north. A more in depth study of Mount Shasta’s geography will yield some more detailed elements of the mountain’s structure. Things worth noting are the presence of four large glaciers on the north and east sides, the presence of large, craggy ridges on the west and south sides, the absence of such ridges on the north and east and the relatively smooth curvature of the mountain’s flank on those sides. All of these elements are indicative of the complex eruptive history of Mount Shasta. Specifically, these observations are indicative of the fact that the mountain is not merely a main volcanic cone with the large Shastina a single satellite cone, but rather, a complex joining of 4 different cones, each representing a different eruptive period. 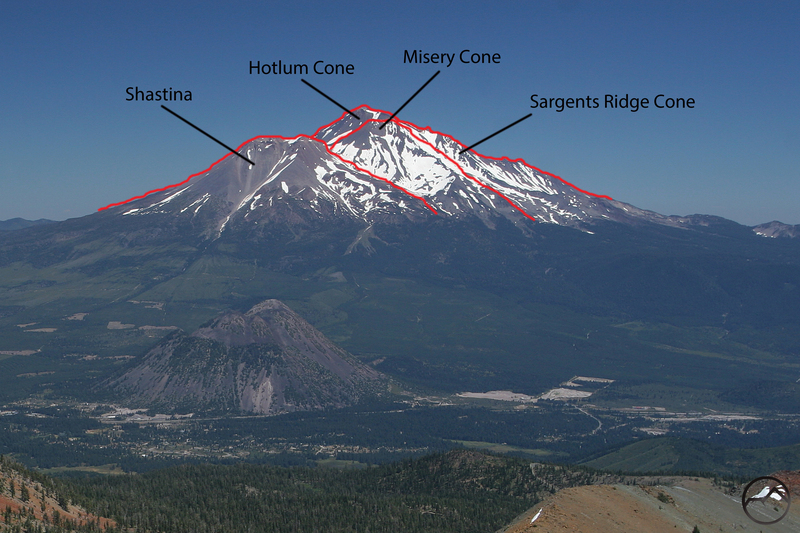 The four eruptive cones of Mount Shasta, viewed from above. The 4 cones of Mount Shasta are, in large measure, the source of the mountain’s splendidly diverse appearance. Depending on the location from which the mountain is viewed, it can have an utterly different appearance. 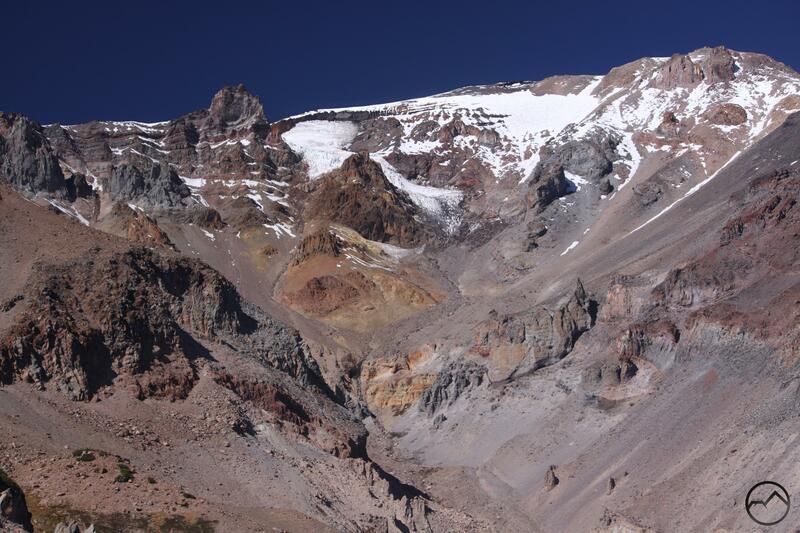 Much of this is due to the presence of Shastina but the arrangement of the other cones also plays an important role in the mountain’s continually changing appearance. At first glance, the other three cones seem indistinguishable. Further observation, however, may expose the truth of the matter. All three cones that compose the main part of Mount Shasta are best viewed from the west. The cones take their names from prominent features related to them. 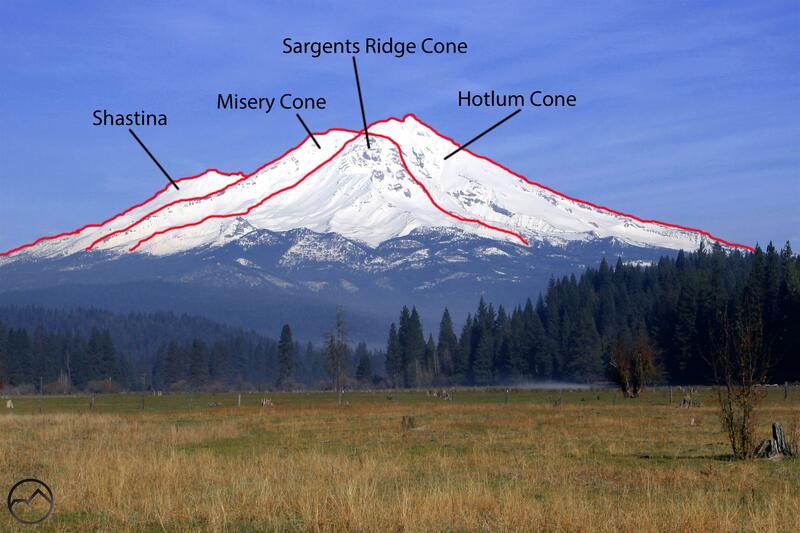 They are the Hotlum Cone, Misery Cone and Sargents Ridge Cone. The first of these is the main summit and it, by itself, makes up roughly half the mass of the entire mountain. 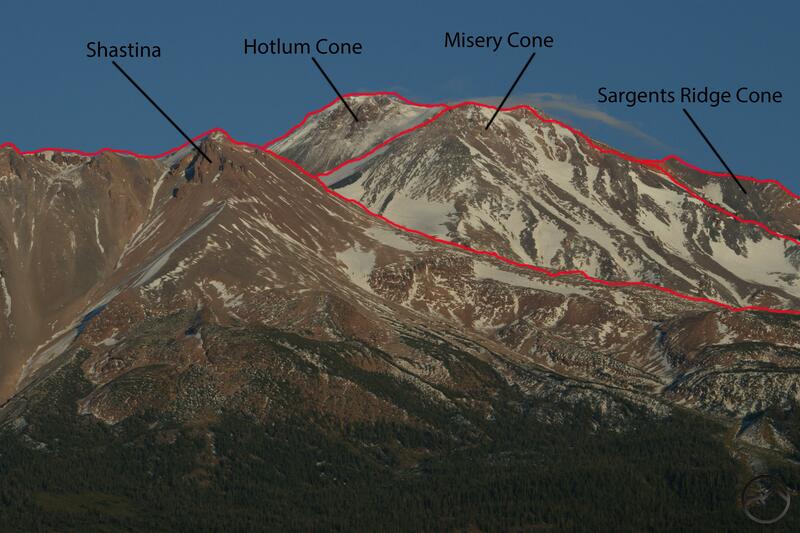 Next, the Misery Cone, is actually prominently visible from Mount Shasta City, obscuring the actual summit and composing most of the highest visible reaches of the mountain. It takes its name from Misery Hill, which lies just west of the actual summit and torments climbers exhausted from the ascent of Avalanche Gulch. 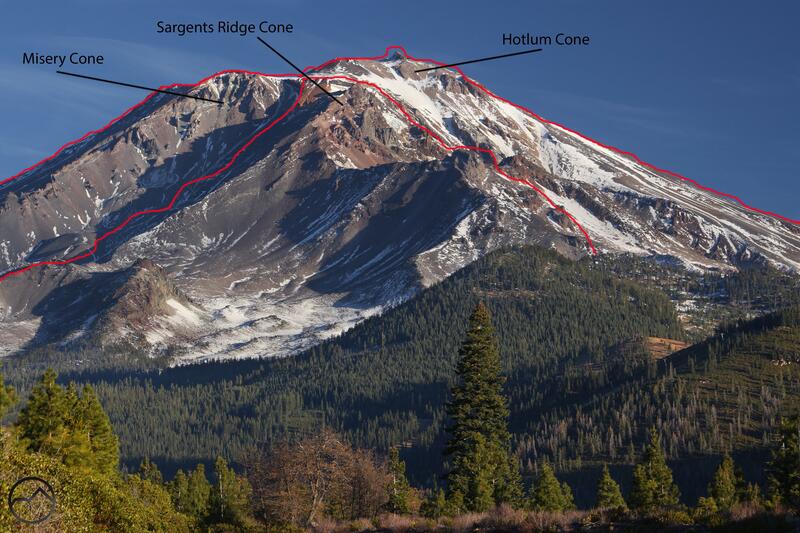 The final cone, the Sargents Ridge Cone, is the oldest part of Mount Shasta. Its rugged striations seen above Avalanche Gulch and even more prominently at the head of Mud Creek Canyon are a mosaic of the detritus of past eruptions. When viewed from the east, only the Hotlum Cone is visible, making Mount Shasta appear as a more typical, conical volcano. Thumb Rock at the head of Mud Creek Canyon. Of the four cones, Sargents Ridge Cone is the oldest. Features like Thumb Rock are the necks of old volcanoes. Erosion and glaciers have cut away at this ancient volcano and exposed the convoluted innards of the old giant. Mud Creek Canyon is often described as being a part of prehistoric Mount Shasta. 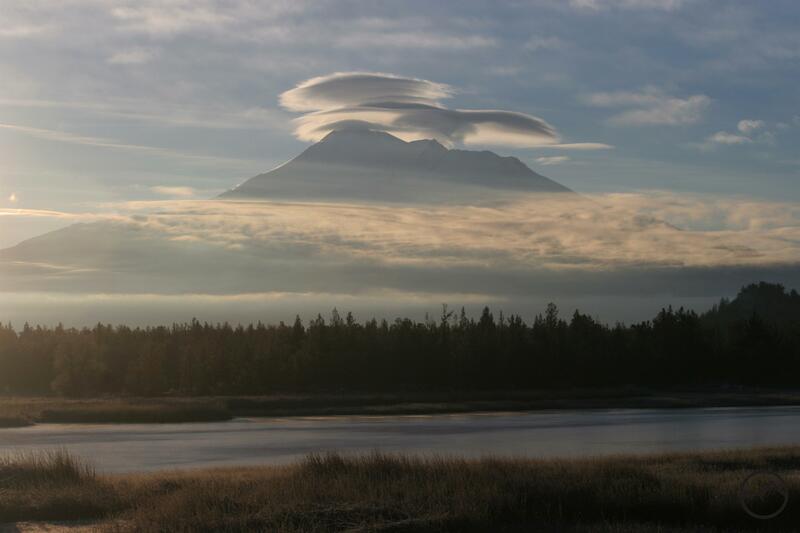 This is because it formed on the oldest part of Mount Shasta and may have predated the later eruptions. Misery Cone is the second oldest, followed by Shastina, which is believed to have formed only in the last 10,000 years. 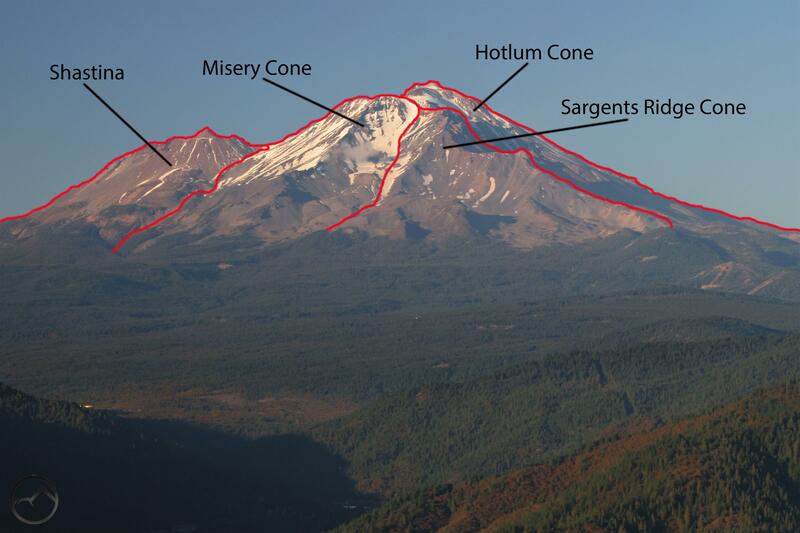 Astonishingly, Hotlum Cone, which makes up the bulk of Mount Shasta, is the newest, formation, having pushed up through all the other eruption cones. Though it dominates the mountain now, it is a recent addition to the neighborhood. Though they may have emerged at separate times, the four cones together combine to make Mount Shasta an utterly awe-inspiring mountain. 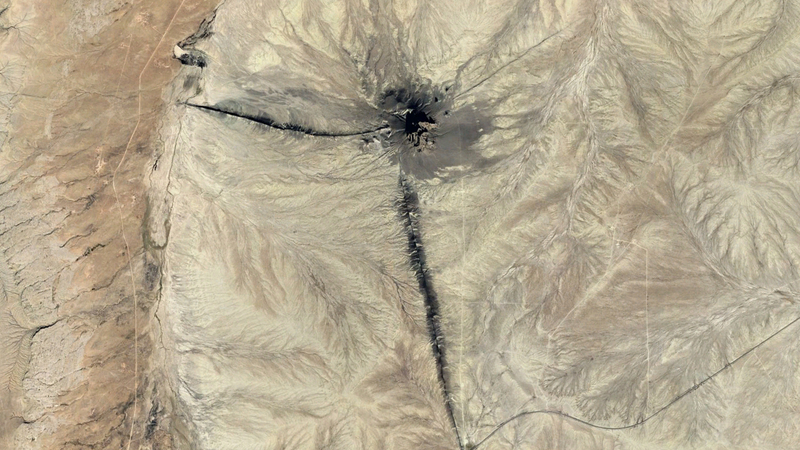 A large dike radiates from Shiprock. Once one perceives the existence of the four different cones, an interesting possibility emerges. 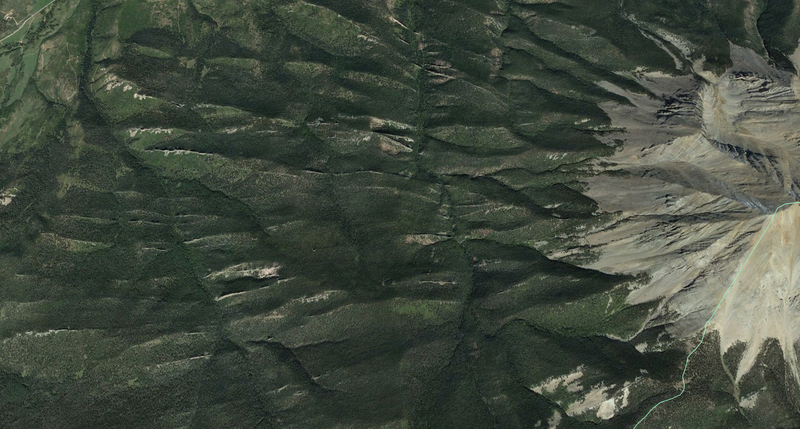 The rugged ridges that extend from eruption points seem like they may in fact be magmatic dikes. These formations occur when magma emanating internally from a volcano intrudes into a crack or fissure. The magma then cools and is exposed via erosion. The way that these features radiate out from the center point of the old eruptions, as well as the ragged crest of the ridges, looks awfully similar to other, well known magma dikes. 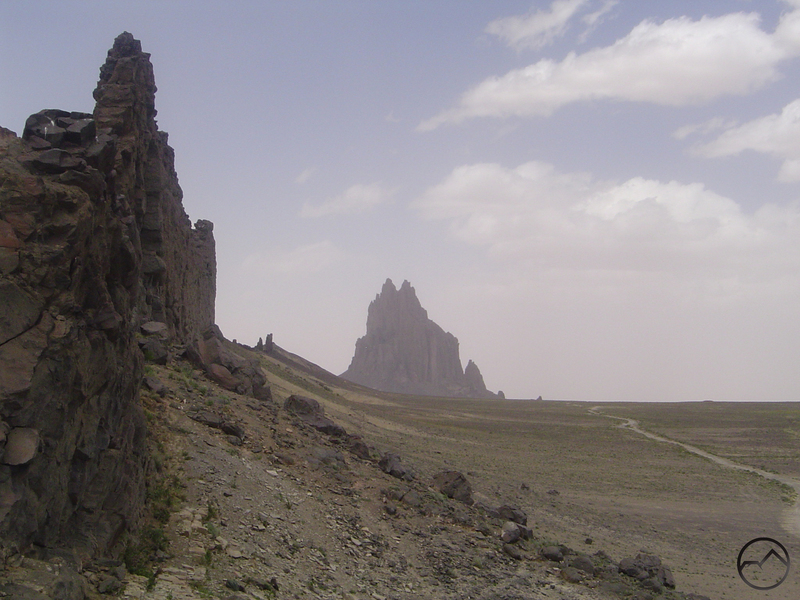 The most notable ones are those that are formed by the mysterious Shiprock in New Mexico. East and West Spanish Peaks in Colorado also have prominent dikes. In both cases, there are central eruptive cones (or their remnants, as in the case of Shiprock) from which radiate large magmatic dikes. The ridges on Mount Shasta seem quite similar to the magmatic dikes present with Shiprock and the Spanish Peaks. 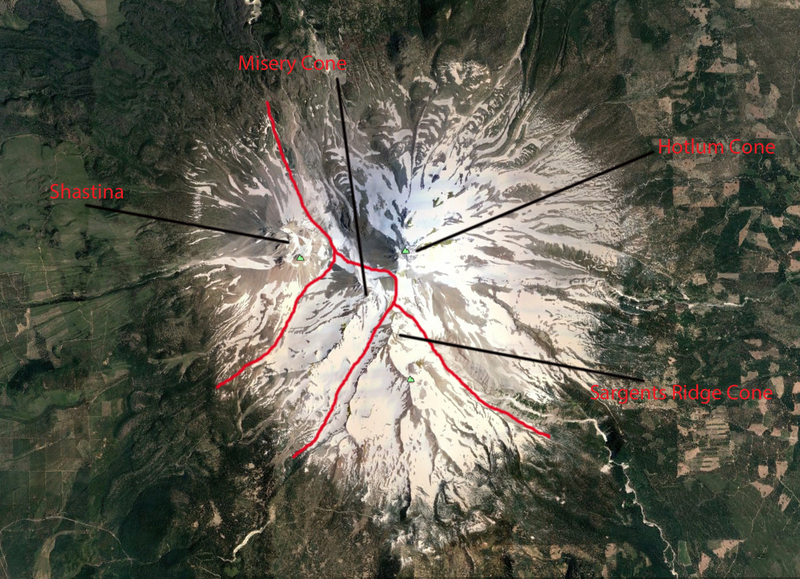 In particular, the southern dike of Shiprock strongly resembles Casaval Ridge on Mount Shasta. The way these ridges connect to the eruption areas on the cones seems to indicated that they are, in some way related to the former volcanoes, just as the dikes on the other peaks are remnants of the volcanic activity in those areas. In both cases the cooled lava has extruded from the larger mass. 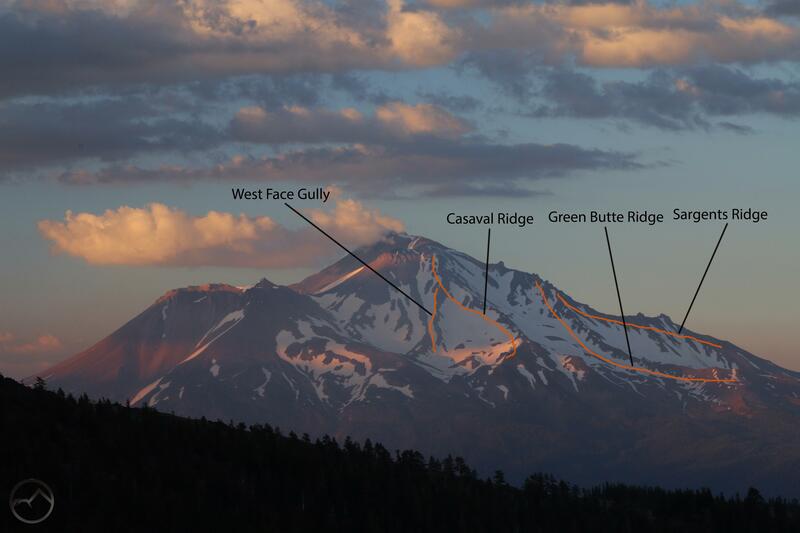 This would also explain why ridges are exposed on Mount Shasta’s south and west sides but not on the north and east sides. The older volcanoes, Misery Cone and Sargents Ridge Cone, were already formed during the Ice Age and were consequently heavily glaciated. The large rivers of ice cut away at the mountain and made apparent the dikes formed during ancient eruptions. 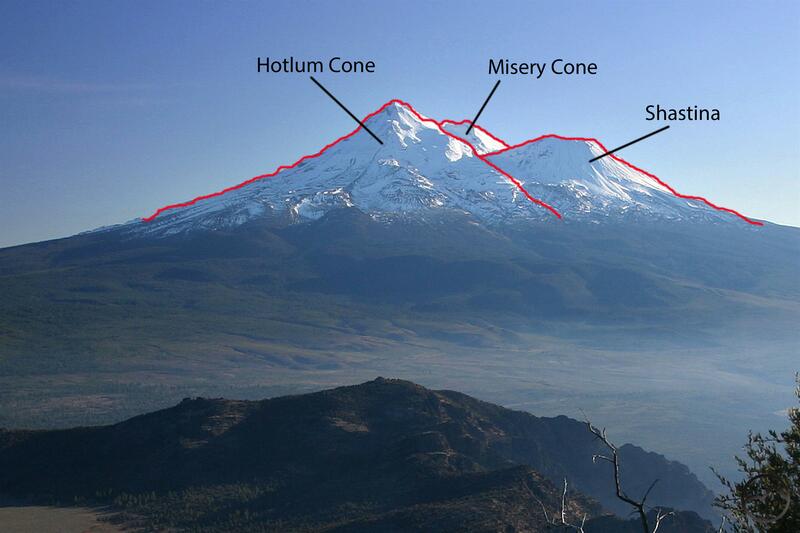 Conversely, Shastina and the Hotlum Cone are believed to postdate the Ice Age and, therefore, have not had glaciers open the mountain up and declare the volcanic dikes that may be present. Of course, Hotlum Cone is currently experiencing the ministry of the Whitney, Bolam, Hotlum and Wintun Glaciers, so the possibility of dikes or rugged ridges being revealed in the future remains. Of course, this is all speculation, but the appearance of the formations seems to fit the theory. Hopefully the recognition of the various eruption cones on Mount Shasta will help admirers identify and distinguish landmarks on the mountain. The mountain’s geography demands to be studied and everyone who admires the Mount Shasta appreciates the combined beauty of the 4 cones.